Do you feed your koi Cheerios? Is this a good idea? Read on! After seeing the look in their eyes my anxiety level rose a bit as I realized they got to have mo’ food. Since the local koi food store was not open at this early hour I knew I had to improvise to keep my pond full of fish satisfied, and the pressure was on. I quickly ransacked my kitchen, scrambled eggs? no. breakfast bar? no. last night’s meatloaf? definitely no. 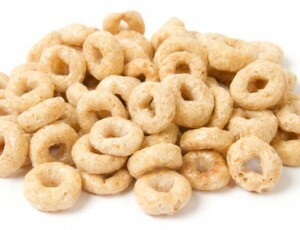 Cheerios? no. or maybe yes. YES, Cheerios, I had heard of other pond people who had given this iconic worldwide oaty breakfast staple to their fish and even claimed that the pond fish liked it, so why not my pond fish, don’t they deserve a good old fashioned breakfast of Cheerios? I had it forced upon me for most of my life…why not my koi too. Anyway, this box of Cheerios had been here since 2004 and it seemed half a decade later it was time to use it. Waste not want not. I went back out to my backyard pond installation, which is a professionally installed pond by Full Service Aquatics by the way, holding the box of cereal between myself and my koi so as to make my intentions apparent to my loving koi. I sat at the arbor, just out of reach of the vice like grip of my koi’s fins and tossed in a handful of those oaty treats. My koi eyed them suspiciously. One of my koi peered through the opening of a Cheerio at me with the menacing look of “if this aint’ good I will squeeze right through this oaty treat, and pull YOU right back through it into this pond and teach you what a hungry fish is capable of”. I shuddered to myself. Then…he ate one, then another ate one, suddenly the rush was on and they cleared those Cheerios that were bobbing around in my watergarden just a moment ago. I tossed in some more and those koi cleared the pond surface again with gusto and continued this until the idea of making a meal out of me was a distant memory. So the lesson here is; learn what other foods your koi will accept, you may be surprised what you can find in your cabinets and refrigerator that will do in a bind. Koi will enjoy a wide variety of foods beyond the pelleted formulas that we all tend to rely on. It can be a lot of fun watching your pond fish devour oranges, watermelon, spinach, chopped hard boiled eggs, even dry cat food; all of this in moderation of course, and who knows, maybe you won’t have to eat your next bowl of Cheerios all by yourself! Just wanted to ck on the cereal to feed the fish. Can they have chocolate types of cereal? Could I feed my koi a coco pop ? Can I feed my babies peach and/or apple cinnamon Cheerios? Koi sounds good especially since i’m thinking of going to japan???????????? We havs been giving our koi cheerios (donut seeds) for around about 5ys now & we are able to feed them by hand . They all seem to know when its cheerio time maybe the color of the box , No. But there are very smart . They love them so much alone w other fruits & veg . Happy health fishies .???? Can I feed my betta pancakes? I really want to. :3 But tiny pancakes. We’ve had koi for 25 years. We have 57 of them, some of them over 25 years old and all of them huge. We belong to a water garden club, and we have all been feeding Cheerios for years in the early spring once the water temp is UP to 55 and in the fall once the water temp gets DOWN to 55. It’s an easily digestible food when the water temp is cooler. Once the water temp gets warmer, we feed good, high-quality koi food. Obviously, once the water gets down to below 55 in late fall and stays there, we stop feeding altogether. Our koi are particularly fond of blueberry pancakes, which my husband makes once a week for us (with plenty of extras for “the koi kids.”). During the winter, we freeze our leftover pancakes so they’ll have some in the spring. They think they’ve died and gone to heaven on blueberry pancake day! There are many types of alternative foods that are safe for fish. Is there a food you are considering specifically? Thanks for the comment. As long as your koi do not spit the seeds your way, otherwise get seedless melon! I use cheerios rarely actually, but they make a good treat. I have spoken with many breeders/dealers and they pretty much all say to use high quality color enhancing food as your staple, but treats can be anything from watermelon and kale to krill and cheerios! Whatever the case, feeding time is oneof the highlights of having a pond and a great way to interact with the amazing koi and pondfish we all love. thanks for commenting Jerry, great feedback! I have given my Koi Cheerios and they loved them as you say . I was at a pond shop buying some very expensive Japanese food one Saturday and a woman came up to me and said “Put that down right now, do not spend all that money on Koi food. I have fish and have had a pond for many years and I feed my fish Cheerios . ” I was horrified until I though about it for a second, we eat them and they are good for us right? I tried it and my Koi love them…I still buy Koi food because I feel the vitamins and additives are better geared to the support of thier health. 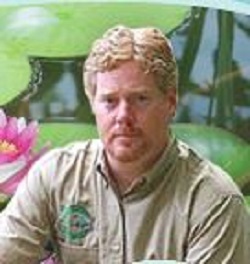 As for watermelon I cut a slice like a wheel thru a melon tie it to the bridge and the Koi eat thru it from underneath..they eat the red flesh first then the white and then the green…..They do spit the seeds out though. Cut up is preferred, julienne style if you really watn to spoil your fish! Do you cut up the watermellon first or just throw the whole thing in ?